My daughter didn’t want me at home today. Incredibly popular all week whilst she’s been raising money for children’s charities, today I was persona non grata… (we’ve definitely entered that age). She still loves me however, in front of friends, at her birthday party – a face-packed-spa-party-sleepover-girly-thing-wrapped-in-turbie-towels (no, me neither) – the prospect of me busting some dad moves was too much to bear, so “the boys” were shipped out. Feigning melancholy admirably, our son sloped off to friends for the night clutching chocolate and computer games; under duress I on the other hand “had” to go to football. 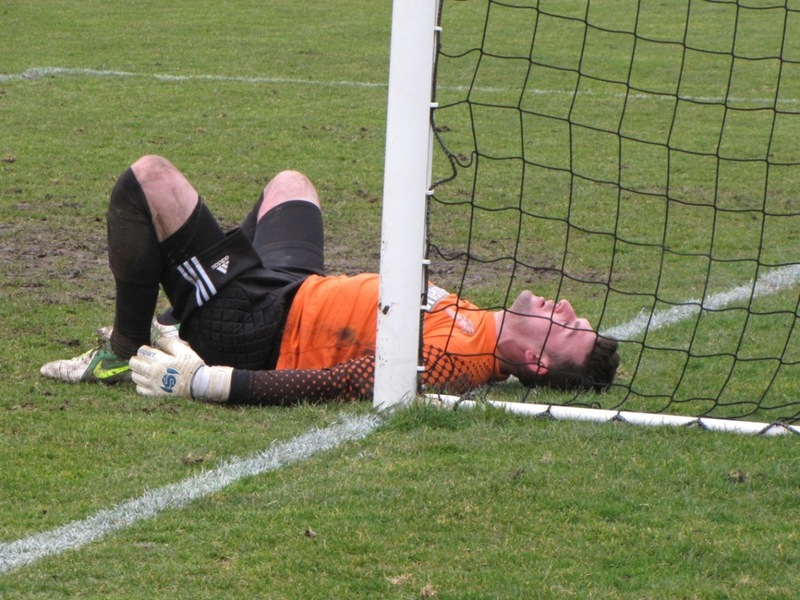 It was a tough job, made tougher by the weather but, someone’s had to do it… Rubbing my furrowed brow, I sighed, holding back the tears (of joy) and quickly unfurled the pre-marked Non League Paper fixture list. Already painstakingly researched, there – amongst the quagmire of colour-coded scribbles – were the week’s top four, all beautifully highlighted. 1. 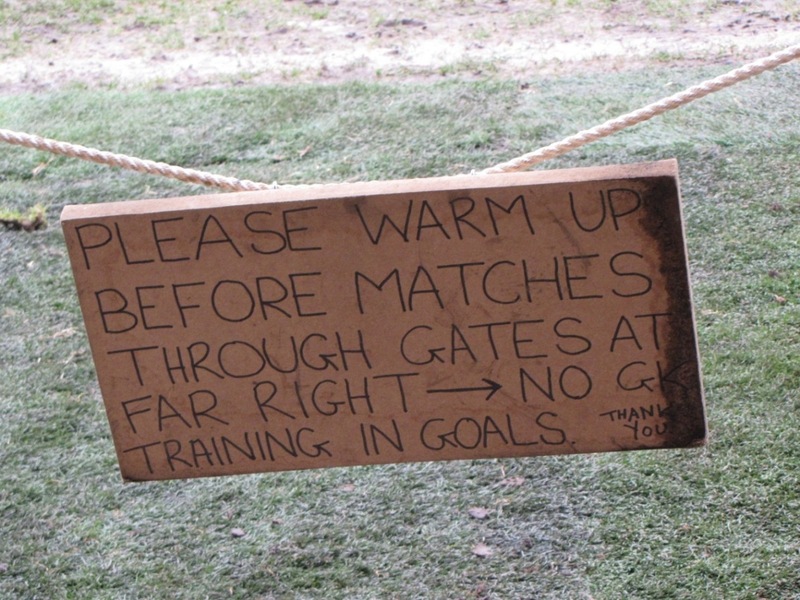 Wraysbury Village FC – East Berks Football League (no idea what step that is), descendants of 1881 club, definitely no programme, rain and snow, game off. 2. Marlow FC – Hellenic Premier League, grandparents had a caravan on the Thames there once, bloody old club, riding high, top of the table, lots of snow, game off. 3. Tunbridge Wells – FA Vase, Semi-Final, 1st leg, the populist choice, touch and go weather-wise but it is a semi final so, game on. 4. 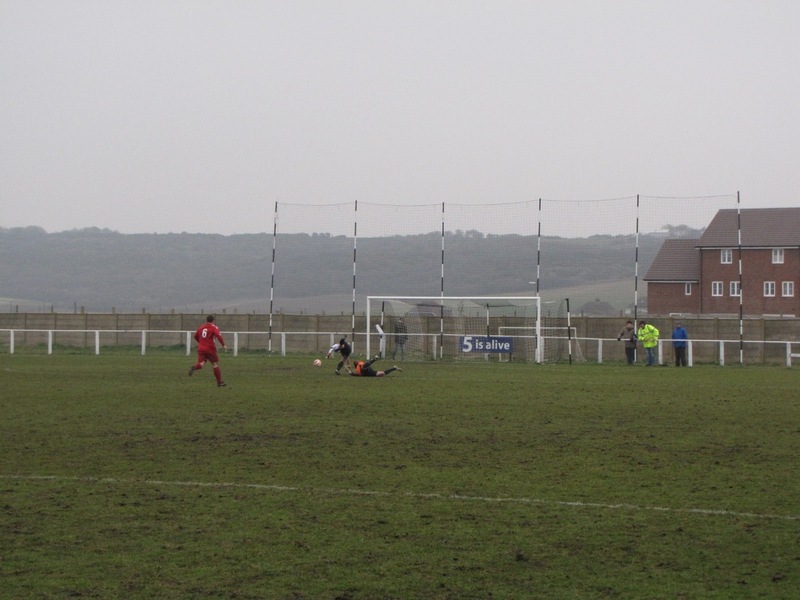 Peacehaven and Telscombe FC – Sussex Div 1, top of the table clash, no idea where exactly it is, two morning pitch inspections, game on. Weighing up the options – with Andy carrot-dangling high profile number 3 – I couldn’t drag my gaze from the bottom of the page. Peacehaven and Telscombe v Redhill, 2nd versus 1st, (27 games and 59 points) v (29 games, 62 points); although I’m developing a quite thing for the exotic life of Non League Sussex I really hadn’t a clue about either team, so I put the kettle on. Twenty minutes later – taking Warren Buffett’s advice – I headed for the South Coast. 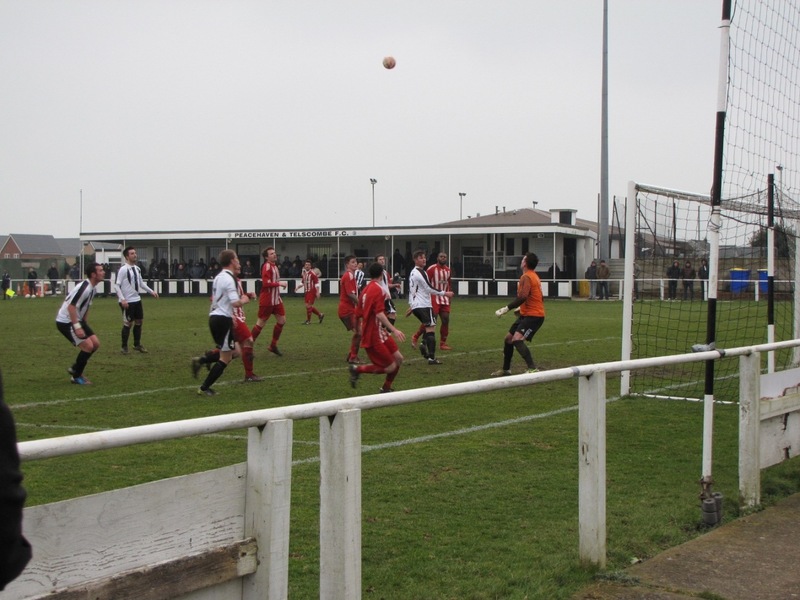 Founded in 1923 following the merger of Peacehaven Rangers and Telscombe Tye (yep, that’s a new one on me too), the home side have lived their whole life in the Sussex Leagues; winning the top division seven times already (four times in the 90s alone). Redhill are much older (1896). Unlike their hosts they haven’t won Division 1 yet but then – hailing from Surrey – they haven’t always been playing football in Sussex. Winning the last ever Athenian League championship in 1984, four years later they left the Spartans and turned up in the neighbouring county. With the country and football programme almost grounded, the blizzardous journey down was still more in hope than in confidence. Visibility was poor; some of the driving worse but, punching through the Sussex border all that changed. Sitting in the eye of one of those super storm thingies, Dennis Quaid jumped in a room and light some gas burners; I (obviously being more butch) rushed back to the car and got just got a second pair of socks. The ground has a tidy 150 seat stand between the dugouts on the far side. A roomy clubhouse stands opposite, it’s open behind both goals, and there’s a popular skate park outside by the turnstiles. In the summer it must be a glorious suntrap; sadly we’ve been trapped in winter for so long no one can remember what summer feels like. 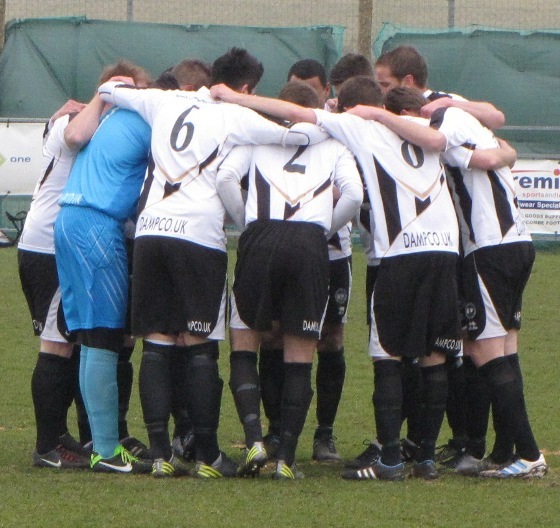 Like penguins, the Peacehaven players – aptly attired in black and white – huddled together before the start, then lost the toss, changed ends, and Redhill kicked-off. We can debate the next ninety minutes in any number of ways but – as the play drew impatiently to a close – it was best summed up by a visiting fan. Muttering with a shrug, he admitted the Lobsters had “not turned up” and were “comfortably beaten”. It just wasn’t their day. After the first three even minutes, Redhill’s Chris Duffy lost a floated Wes Tate cross in the breeze. It duly hit the back of his net. Ten minutes later – after breaking at speed with teammates – Joe Dryer deftly hammered home from a tight angle, and a minute from time Tate had done it (and Duffy) again; this time from a free-kick. Same side of the area, same cross, same breeze, same result. 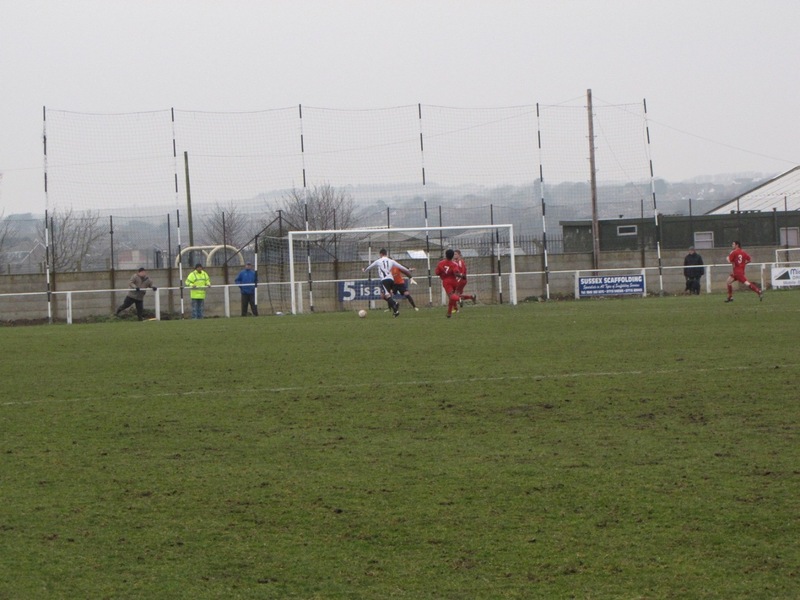 As if the only purpose of football today was to keep warm, whilst Peacehaven showed some composure on the ball table-toppers Redhill flapped about it. When they weren’t flapping, they shouted about it on and on, and on. Rarely have I heard so much said about so little (though I do have a theory that it might also have been keeping them warm). Making the match more even, the visitors improved in the second period without any loss in shouting. For clarity’s sake, the frustrations were evident to all watching; whatever skills had led them to the top of the table they’d clearly forgotten. 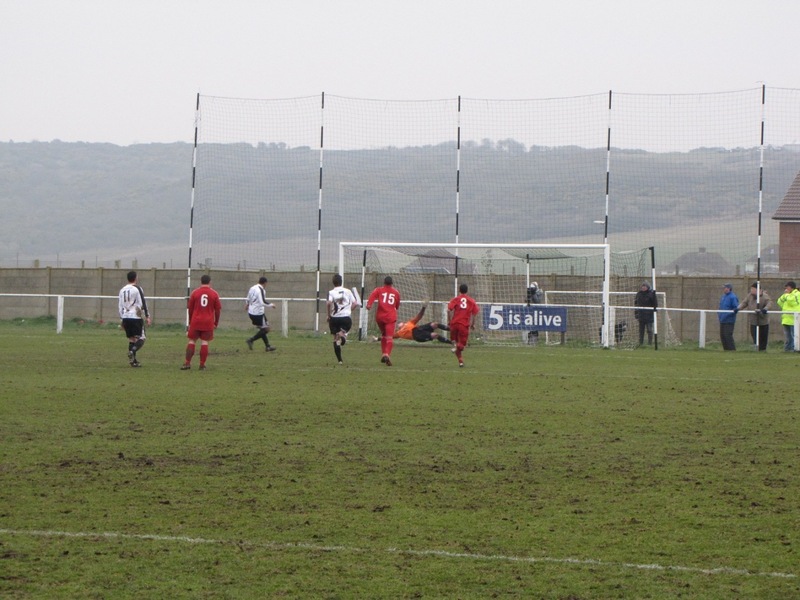 In between the missed passes, Redhill had countless corners and often put the ball “in the danger zone” but, they just found Peacehaven’s keeper Joe Adams in commanding form. Without being forced into astonishing saves, his positioning was superb and on the one occasion he wasn’t protecting goal, the equally composed Kerry Mayo headed off the line. The only other two incidents this half were penalties. One that was (from which Tate scored his hat-trick and left me wondering whether at this level he gets to keep the ball), and one that most definitely wasn’t (resulting in some squabbling over diving and a couple of yellow cards). To surmise the entertaining encounter: it was untidy, with four goals, four yellows, and four huge degrees below what I would consider far too cold to be out. In truth the only warmth to be found was in the welcome of the club, the conversation of spectators, the Bovril, and the clubhouse which felt comparatively like a sauna in the interval as supporters sheltered from the Quaid-like cold. 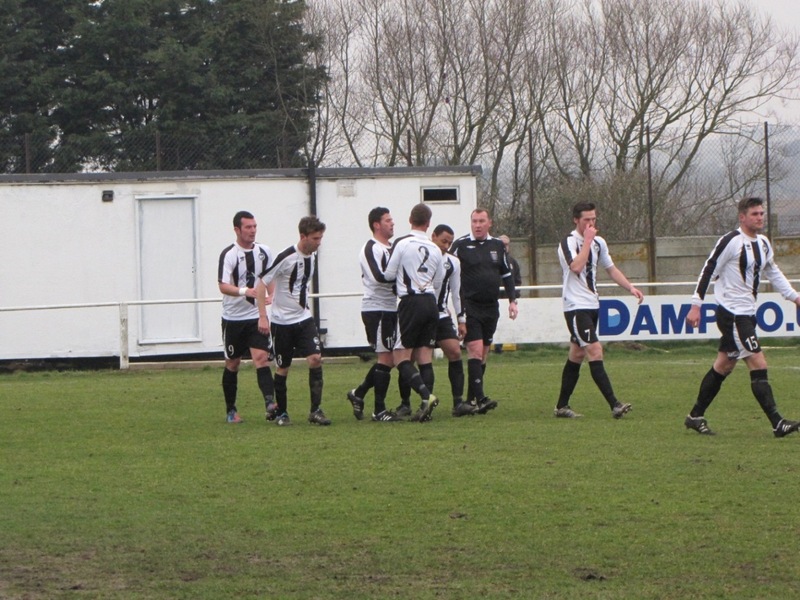 It was in there – as I checked for the FA Vase halftimes – I started noticing the name Connor Saunders, everywhere. To recap my subsequent research: Last season as I was fussing over the FA Cup Semi Final, promising young Peacehaven footballer Connor died from a single punch, in an unprovoked attack on a night out with friends. Clearly the devastation of his passing has only been eased by the lives he saved through organ donation. Now a year on, as well as encouraging others to become organ donors, The Connor Saunders Foundation works in the local community to provide qualified football coaching for children with disabilities. In a week where I’ve spent every waking hour worrying about the altruistic plans of my brave little girl, it seemed apt that having been sent from home (by said girl) I would find myself warmed by the fine charitable work of a team that has lifted the RUR Charity Cup seven times. As cold as it was, today’s match was only one in long season; there’s no Charity Cup Final at stake but, promotion could surely be round the corner for one of these two sides, and though still tight, with this engaging win Peacehaven leapfrogged Redhill at the top of the league; level on points but, with two games in hand and a huge advantage of goal difference. Heading through Brighton, back to a house full of girls all having facials – thankfully in the warmth of the car with The Who drowning out Robbie Savage – I was certain there was only one person to blame (and thank) for me discovering Peacehaven and getting the last programme; she who “made” me go out. 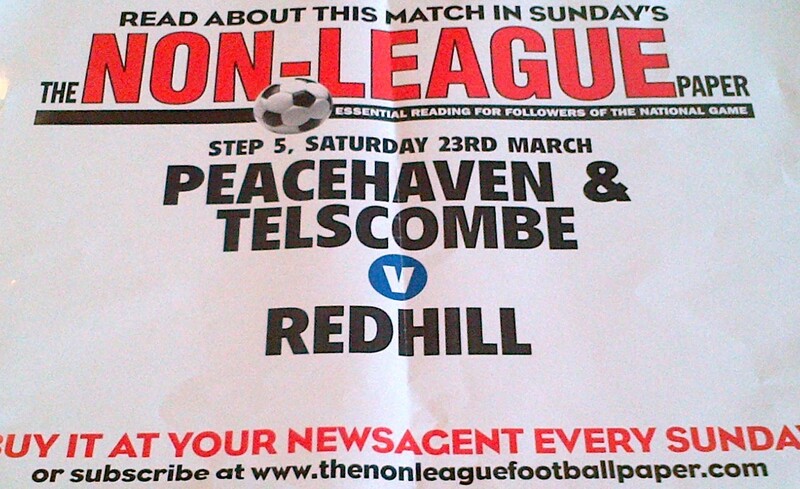 This entry was posted in 2012-2013, Sussex County Football League and tagged Peacehaven and Telscombe FC, Redhill FC, Sussex County Football League, The Connor Saunders Foundation. Bookmark the permalink.